NEW HAVEN, Connecticut: In early February, the Yale University’s Film Studies Program organized its annual conference on the theme: “The Avant-garde in the Indian New Wave.” No doubt a milestone for the academically neglected arena of Indian avant-garde cinema, the three-day conference drew distinguished scholars from both India and the United States. The keynote address by Ashish Rajadhyaksha (Center for the Study of Culture and Society at Bangalore), referred to filmmaker Kumar Shahani’s papers by way of examining the birth of film theory in India, and setting out the possible parameters within which the New Indian Cinema might be understood. Scholar and filmmaker Ashish Chadha (Yale University) and independent film critic Amrit Gangar from Bombay, discussed the cinema of “Prayoga” which seeks to amalgamate indigenous elements of Indian philosophy with aspects of western modernity. Our own Professor Richard Allen (New York University) presented an in-depth and critically engaging analysis of the aesthetic and formal experimentations in Mani Kaul’s film Duvidha, underscoring the tactile quality of the film and its close resemblance to Rajput and Mughal miniature paintings, as a strategy for flattening or “neutralizing” depth perspective. This argument was complemented by departmental Ph.D. candidate Aparna Frank’s stimulating paper titled, “Illusions of Narrative: Color and Camera Movement in Kumar Shahani’s film Maya Darpan,” which noted the “painterly sensitivity” in the filmmaker’s shot compositions, and the function of both montage and abstraction in the film. Richard Suchenski (Yale University) and Parag Amladi (NYU departmetnal alumnus) interrogated further the cinematic categorizations of the experimental, underground, and avant-garde, while underscoring the challenges posed by the absorption of diverse art, media, and literary forms into film practice. The last day of the conference addressed the Political New Wave which included Moinak Biswas’ (Jadavpur University, Kolkata) examination of the historical development of political cinema in West Bengal and Kerala; Suranjan Ganguly’s (University of Colorado, Boulder) discourse on power structures and politics in Adoor Gopalakrishnan’s films Rat Trap and The Servile; and Manishita Dass’ (University of Michigan) engagement with issues of authenticity and the subaltern as depicted in Mrinal Sen’s film Aakaler Sandhane. 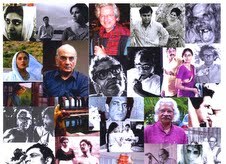 The screenings included Satyajit Ray’s Aranyer Din Ratri (1970), Ritwik Ghatak’s Jukti, Takko Aar Gappo (1974), Kumar Shahani’s Khayal Gatha (1989), Mani Kaul’s Siddeshwari (1989), Adoor Gopalakrishnan’s Kathapurusham (1996) and Mrinal Sen’s Oka Oori Katha (1977). The conference raised significant issues about the birth and development of the Indian New Wave, its political implications and diverse cinematic representations. There was much debate around the term “avant-garde” and whether it was suitable for describing some of these films, considering that the term is derived from the west and does not take into account the socio-political and historical particularities of films made in South Asia.